New York’s Mayor has stepped in it again. 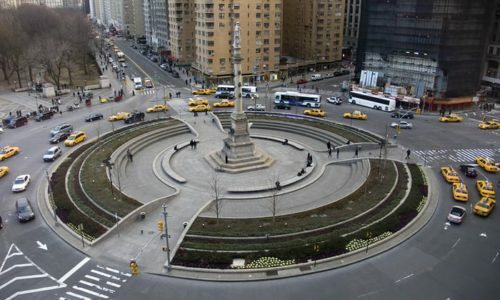 This time he is bowing to the pressure by Leftist groups, to take down what they and he are referring to as “symbols of hate,” but what most reasonable people refer to as “statues commemorating historical events.” So, according to de Blasio and his like-minded ilk, apparently history is just one long hate filled episode that needs to be erased. The only problem is that history cannot be erased. The newest target of these would-be destroyers of history is the 100+ year-old statue of Christopher Columbus in the center of New York’s famed Columbus Circle. The statue was a gift from New York’s Italian community in 1892 and also from groups such as the NYPD Columbia Association, which counts thousands of Italian American police officers as members. 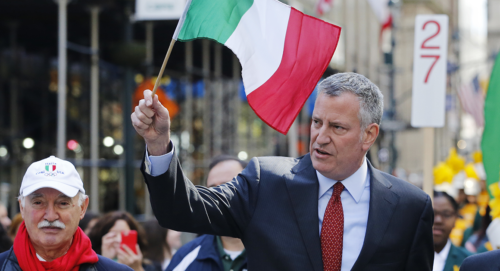 De Blasio himself bears an Italian name and often pretends to be in solidarity with the Italian community as he proudly waves an Italian flag, especially during the COLUMBUS DAY PARADE. (See picture.) Will he also try to change the name of the parade? Hypocrite. There are protesters calling for the removal of the statue as well as counter protesters calling for it to be left alone. We will see how it all plays out. But here’s the thing that no one seems to want to acknowledge. There isn’t a single people group in history that didn’t do reprehensible things to other people groups. There’s also not a single people group in history that didn’t add some kind of value and innovation to their lives or to the lives of others. The idea that influential historical figures are supposed to measure up to some 2017 ideal of perfection in every aspect of their lives and beliefs is ludicrous. No person who has ever lived can meet that standard. So it is time to grow the heck up and stop trying to eliminate the historical references to certain people groups. Let’s be clear, many slaves who were kidnapped and sold to slave ships, were sold by their fellow African people. Enemy tribes sold their rivals to slave ships. So, if there is going to be blame passed around, let’s be accurate. African people contributed to the horror of slavery just as European people did. That’s what history looks like. It’s inconvenient and often ugly. It can also be beautiful when we look at positive contributions and innovations. History is an equal share of blame for history’s horrors, as well as an equal share of credit for history’s triumphs, to go around. It’s a mixed bag at best. There simply is no group in the past that can claim to be without wrongdoing. America is a melting pot of people from every group on earth. And every group on earth has its good and its bad history. Every single statue all across the nation, should stay up. No one should be able to tear down any other group’s statues. Leave them all up. Mayor de Blasio, leave Columbus alone. Leave every monument in your city alone. They are all part of the history. History can’t be erased or changed. But it can be understood. Learn it. And learn from it. And if we learn anything at all about history, it is that those who tear down the monuments of others will soon meet the same fate. Let’s not allow our culture to believe that somehow we know whose monuments should stay and whose should go. Because if we are pulling down granite and bronze people who symbolize hate and bigotry, then we are going to need to go after Malcom X, Che Guevara and Margaret Sanger. We are going to need to go after native Americans who enslaved, scalped, tortured and murdered their fellow native Americans and others. All of these people contributed negative history to our nation and others. But their statues should not come down. And neither should Columbus’. They are all an influential part of who we have become and how we got here. No statue should be taken down. None. Leave them all alone. You see, marble and bronze statues, they can’t actually do anything to anyone. At least they can’t do anything to anyone that a person doesn’t allow. We control our thoughts and emotions, and we control whether we will be offended or angry or feel threatened. We cannot be controlled or even affected by the granite likeness of a dead guy. He’s dead and his scheming days are over. Get woke Mr. Mayor. How about worrying less about dead guys in bronze and more about guys in your city who are causing people to be dead. Instead of focusing on the sculpture-cide rate, take a look at the homicide rate. Columbus discovered America, but you can’t even discover your own spine.